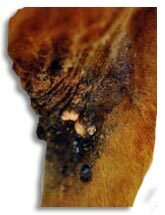 A papilloma virus (wart) is probably what causes horse sarcoids. A high proportion of sarcoids contain genetic material that is identical, or very closely related, to the bovine papilloma virus (BPV). However, no live virus particle has yet been found. Experimentally, it is possible to produce sarcoid-like swellings by injecting horses with BPV, but usually the swellings resolve spontaneously. So it seems likely that the host response is an important factor. 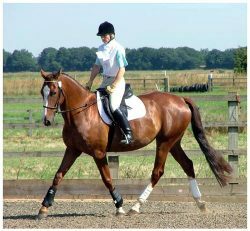 There appears to be a genetic connection with equine sarcoids, with certain family lines being more susceptible than others to sarcoids. It has been suggested that an autosomal recessive gene controls the degree of sarcoid aggression shown. How Do You Know it’s an Equine Sarcoid? Usually the clinical appearance is adequate to make a diagnosis. Especially if several sarcoids of more than one type are present on the same horse. It is more difficult if only one occult sarcoid is present. A biopsy (removing a small piece of tissue for examination under the microscope) will usually confirm the diagnosis. Avoid this, unless it is possible to remove the whole mass. Partial biopsies are likely to induce the fibroblastic sarcoid form. Also, small biopsies may not include enough tissue features to reach a full diagnosis. The fibroblastic form presents particular problems in diagnosis in that it has a fleshy, ulcerated appearance which may be indistinguishable from proud flesh. Sarcoids are even more difficult to identify when they occur at the site of an open wound and are mixed with granulation tissue. If proliferative granulation tissue results from wound breakdown, especially if sarcoids are present elsewhere on the body, it’s best to have a biopsy to detect the sarcoids early. As a general rule, you should only consider a biopsy if the whole tissue mass can be removed or if there is wound breakdown in the presence of sarcoids. A new technique developed in Belgium offers the possibility of detecting equine sarcoid involvement in wounds or sarcoid recurrence after removal. A swab or scraping from the surface of the tissue is examined for the presence of BPV-DNA using a polymerase chain reaction technique, a very sensitive method of detecting genetic material. However, this technique has no advantages over clinical appearance for the diagnosis of most types of sarcoids. But, it is useful in ulcerated lesions to differentiate a sarcoid from normal granulated tissue. 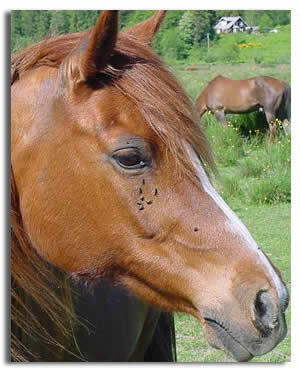 A U.K. veterinarian has possibly linked common face flies to the spread of sarcoids, one of the most commonly encountered equine neoplasias (tumors), and it is conceivable that the risk of spreading sarcoids could be minimized through good horse management techniques. The research also further supports that bovine papillomaviruses (BPV) are involved in causing equine sarcoids in horses. Jeremy Kemp-Symonds, MRCVS, a PhD student at the Animal Health Trust in Newmarket presented study results during the clinical research sessions at the 46th Congress of the British Equine Veterinary Association, held in Edinburgh, Scotland, Sept. 12-15, 2007. "Despite being very common, there’s a great deal that we don’t understand about equine sarcoid," said Kemp-Symonds. "It appears to have a viral etiology, but an unresolved mode of transmission." He noted that fly vectors are mentioned often in the scientific literature about sarcoids, and he said there are numerous anecdotal reports of sarcoids developing at sites of previous injury and trauma. He also said it is common for horses to get sarcoids in the perigenital region, where flies often sit. According to Kemp-Symonds, Musca autumnalis face flies feed on lachrymal (tearduct), oral, and nasal discharges, and wound secretions. M. autumnalis is closely associated with predilection sites for sarcoids, and it’s an important vector of veterinary diseases, he added. The researchers collected and froze more than 500 M. autumnalis flies infesting six sarcoid-affected Thoroughbred or Thoroughbred-cross horses from the Wye Valley area (encompassing the border of England and Wales). They ran a type of DNA assay called a polymerase chain reaction test on the flies and on tissue from sarcoid-infected horses. Ninety-eight percent were coming back positive for BPV-1 and BPV-2 (bovine papilloma viruses); he said. These papilloma viruses are commonly accepted to be the causative agent of the equine sarcoid. "When we looked at the tissue samples … we got no amplification from any of the control tissue (tissue without sarcoids)." The BPV types were very similar, which is suggested of locally active subtypes of BPV. These results also suggest that M. autumnalis could be a mechanical vector of both BPV-1 and BPV-2. Additionally, if the potential exists for horse sarcoids to be spread through wounds, he suggested there might be "some iatrogenic involvement in these cases," meaning that sarcoids could be induced inadvertently by a veterinarian or by medical treatment or diagnostic procedures. "You can try and minimize fly infestations, especially animals with open wounds, and post-surgical cases,". Control measures include equine housing, insecticides, repellents, and traps. My suspicion is there is horse-to-horse transmission, he said. "These horses were geographically very isolated from horses where there were cattle with BPV. When you look at the habits of flies, they tend not to fly great distances to go from one meal to another. About 3 km is as far as they go. So it’s easy to fly from a sarcoid-infected horse to a horse with open wounds.